Breathtaking views of both the Atlantic Ocean. This is the sport of gold on St Kitts & Nevis. Two small islands but so much for the discerning golfer. St Kitts & Nevis’ four golf courses include an 18- hole championship course on Nevis, plus two 18-hole championship courses and a 9-hole course on St Kitts. 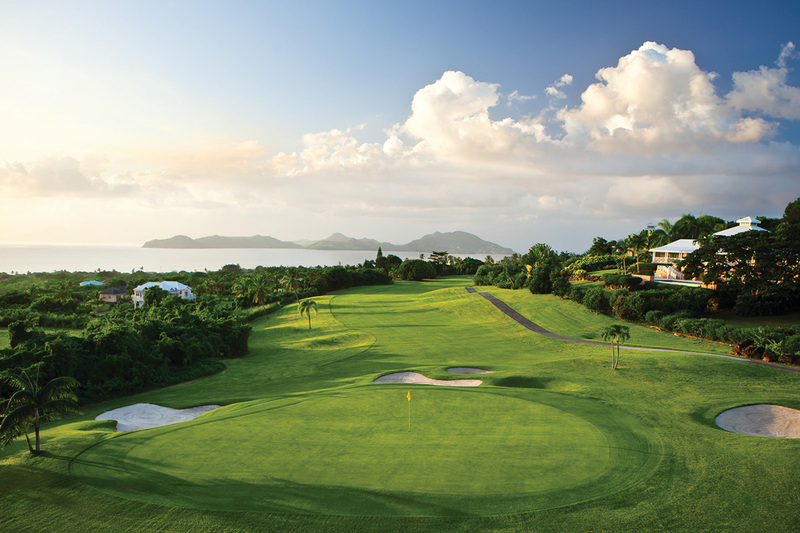 The Robert Trent Jones II golf course in Nevis offers a serious challenge as well as spectacular views. The downhill, 663 yard (gold tees) par 5 is the signature of the course and the whimsical black tee (the only black tee on the course) attracts good and brave players. From the tee, perched 450 feet above sea level, a jungled chasm stretches 240 yards to the fairway and the cart ride through the gorge from tee to fairway is unforgettable. The Royal St Kitts Golf Club sits on a peninsula near Frigate Bay, with views of the Atlantic on one side and the Caribbean on the other. Designed by five-time British Open winner Peter Thompson, the route has plenty of water hazards and tricky sea winds that can come from all directions. Irie Fields at Kittitian Hill was designed by former US Masters winner and winning captain of the 2006 European Ryder Cup team Ian Woosnam. Embodying sustainability, it has been described as “the world’s most edible golf course” with caddies sharing tips on the course including where to pick the ripest, juiciest tropical fruit. Smart water management and abundant organic crops reduce the impact on the environment. Every hole of this par 71, 18-hole course offers spectacular views across the sea to the islands of St. Barths and St. Martin and more shades of green than you can imagine. The name ‘irie’ means to be at peace and harmony with yourself and where you are. The upcoming championship 18-hole golf course at Christophe Harbour, is the vision of Tom Fazio, who describes it as “the best of the best” of Caribbean golf courses. Set more than 500 feet above the sea, it will offer breathtaking views and new challenges for golfers. With golf practice facilities, a clubhouse and restaurant, the new course joins The Royal St Kitts Golf Club, Kittitian Hill’s Irie Fields, and the Robert Trent Jones II golf course on nearby Nevis as a great golfing destination. FACT: International scheduled airlines and charter carriers serve the island regularly. There are daily flights from Miami and British Airways flies twice weekly from London-Gatwick Airport.